Vanessa Minnillo - TV personality, actress, model and Nick Lachey's girlfriend was spotted this week at an event wearing a piece of jewelery from Nicole Richie's collection, House Of Harlow 1960. 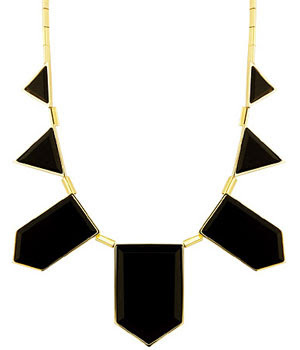 Vanessa opted for the black resin triangle necklace. This is a very popular piece from the House of Harlow collection as Paris Hilton, Kim Kardashian and Nicole Richie herself love to wear this necklace to showbiz events. Whilst on the topic of Nick Lachey. Here is a couple of pictures of Nicole Richie and Nick Lachey presenting an MTV award together back in 2006. I personally still think its a shame him and Jessica split, but thats old news! Anyways, Vanessa totally suits the House of Harlow 1960 black resin necklace, it is so nice to see other celebs supporting Nicole Richie's expanding collection.